Structural biologists from all fields of biology gathered at the West Coast Protein Crystallography Workshop in Asilomar, California, March 19-22, 2017. Recent findings and advances in structural analysis were presented as well as workshops on molecular animation and crystallography-related software. Researchers presented their work with oral presentations and poster sessions. 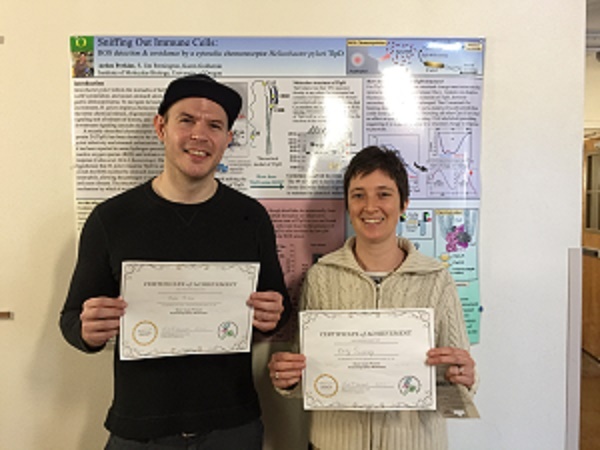 Arden Perkins, a META researcher and long-time attendee of WCPCW, won an award for Outstanding Talk for his presentation titled “Peroxiredoxin Catalysis at Åtomic Resolution” and META researcher Emily Sweeney won an Outstanding Poster award for her work titled “Bacterially Secreted Anti-inflammatory Protein has Calycin Fold.